Borussia Dortmund defender Hummels rose to head home Toni Kroos's free-kick on 13 minutes to settle a cagey encounter at Rio de Janeiro's Maracana Stadium. Joachim Loew's side will now play the winner of Friday's second quarter-final between Brazil or Colombia in next Tuesday's semi-final in Belo Horizonte. 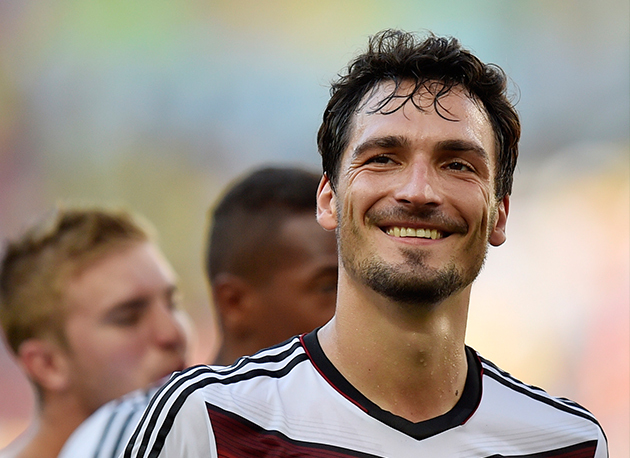 "The next dream has come true," said man-of-the-match Hummels. "It's unbelievable that it's all going so well for us here at the World Cup. "I hope that our journey won't end soon and that we can make it back to compete here week next Sunday," he added, referring to the July 13 final. France coach Didier Deschamps bemoaned his team's failure to capitalise on the handful of chances they created. "There was not much between the sides," Deschamps said. "One team is more used to these occasions and has more experience. "We were not clinical in front of goal." France had entered the match quietly confident of avenging semi-final defeats against Germany in 1982 and 1986. But they were left to rue a lacklustre first half performance which saw Germany dominate in sweltering conditions. France rallied in the second half and Hummels saved Germany with a desperate late block of a Karim Benzema shot shortly before Manuel Neuer parried a firm strike from Blaise Matuidi. Andre Schuerrle should have sealed victory in the closing minutes, but with the goal gaping, struck his shot from Mesut Ozil's low cross directly at Hugo Lloris in the French goal. There was still time for Neuer to save Germany at the death, pulling off a brilliant block from Benzema just seconds from the final whistle. In Friday's other quarter-final, Brazil will aim to banish their jittery second round performance against Chile when they face Colombia in Fortaleza. To ensure his men were in the right state of mind for the battle ahead coach Luiz Felipe Scolari ordered an extra session with the team psychologist this week. "I had never done anything like it before and I am quite enjoying it," reported Neymar, fully fit despite thigh and knee injuries against Chile. Captain Thiago Silva insisted the squad were capable of coping with the pressure. "I think we are good psychologically. We are doing what we love to do," the Paris Saint-Germain defender said. Scolari, mastermind of Brazil's fifth title in 2002, cut a confident figure at the eve of match press conference. "Does Brazil continue to have one hand on the trophy? Yes," he said. "We are going on to the fifth step and there are seven steps." The fourth step caused 200 million Brazilian hearts to flutter as Chile gave the hosts the fright of their lives in a bruising encounter, only succumbing in the spotkick lottery. Four eyecatching wins have propelled Colombia to uncharted territory at the World Cup to face a rival they have only beaten twice in 25 meetings. "We need to play our own game as we have done up to now and try to impose our play on them," Argentine coach Jose Pekerman reflected. "The key is not to believe there is a favourite." Friday's games go ahead in the shadow of an overpass collapse in semi-final venue Belo Horizonte which killed two, and an illegal multi-million pound ticketing scandal involving a FIFA individual. The quarter-final drama continues Saturday when the Netherlands play Costa Rica and Belgium take on Argentina.